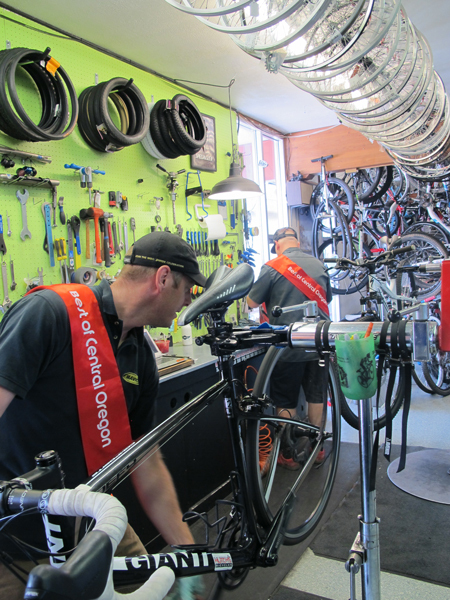 A local fixture for more than 30 years, Hutch’s Bicycles has grown alongside Bend’s bike culture. When Jim Lewis—who has worked with bikes since he started building them in his garage at age 9 and has never been employed by any other company—was tasked with opening the first of two Bend shops on the eastside in 1981, he quickly inserted himself and the shop into the local cycling scene. Hutch’s General Manager Mike McMackin says Lewis started the noon ride, a 90-minute (and typically 30-mile) lunchtime race that was, from the 1990s through 2000s, a benchmark training ride in the state. Though participation has trickled down to a handful each weekday, McMackin says they once joked it was the only 300-day stage race. As Bend has become a destination not only for outdoor enthusiasts, but also for families raising children, Hutch’s has kept pace as a family-friendly shop. McMackin points out that not all bike shops sell children’s bicycles, but at Hutch’s they are a highlight. And, he adds, the staff tries to treat customers like family, too.